The next step with my ‘89 245 +T automatic is to install the T5 which I bought from turbotankshane a couple years ago now (time flies). The first and easiest step is to install the pedal assembly. Which will also coincide with me installing a new brake booster. and have read a couple of others like it. Has me thinking of the pedal assembly needs to beefed up before I install? If so where is it weakest? My plan is to go hydro clutch pedal and that may eliminate much of the stress as opposed to the cable type clutch. What are your power goals / what pressure plate are you going to use? Power goals are minimal. The 245 with 19T and white injectors with 4 bar FPR is a bit quicker than my N/A 850 which is completely stock. So I'm guessing I'm at 180-185hp, would like maybe 200-215. Have no turbo gauge and no wideband presently.......I know...I know. I've been babying it with wastegate rod barely tensioned. If the poor AW70 would shift a little quicker instead of sliiiiiiiiding into the next gear. Its the Saab 240mm pressure plate. I did a couple threads on severely reinforcing that box after I mangled it and then managed to also rip the captive nut mounting point out of my cowl. Cause was a very heavy clutch. The last fix was 2013 and all has been good ever since. Perfect Dave! Thank you sir. The 245 with 19T and white injectors with 4 bar FPR is a bit quicker than my N/A 850 which is completely stock. This is super sad and discouraging for any newbies looking to boost their 240s. Please delete. The 240 mm Saab 9000 Aero Spec clutch I was using on mine held 350-ish whp without breaking a sweat, and it had a very normal pedal stiffness. No heavier than the clutch pedals the 4Runner, Jetta, or 544. Bigger diameter makes more torque handling with less clamping force (which translates into pedal force required). John how thick was your clutch disc for the saab areo 240mm pressure plate? I'm running a bmw z3 disc 240mm and I think it's a wee bit thick. I can make it slip with my 90 13c wagoon..I shoulda put in washers, dammit Lummert. Second gear rev clutch drops at the top drifto corner of cornelius pass.. But that's just me being stupid. Last edited by sbabbs; 12-20-2018 at 08:38 PM..
Not a clue. I bought the PP and disc from Spec (stage 2+), never sweated the fine details on it. Well you have youth and ignorance in your favor. I've chosen to take simple reasonable steps in my turbo build as money and time allows. Don't have dyno tests to back up every mod that has been performed. Assuming that when I installed the T3 turbo parts from the '87 760 that my hp figure would be 170ish. Maybe with the 19t I've gained another 30hp. Without a boost gauge or wideband I don't want to crank it up and toss a rod or shell the auto before I'm ready to swap to the T5. Nah, mine has been done for quite some time and I'm running stock boost through a 13c. I am positive it is quite a bit quicker than an NA 850. Your auto must be the only thing slowing you down. It should be spinning stock tires in first gear when you floor it, no doubt. No....it does, I just choose not to do that right now. Broken ish is expensive and takes time to fix. 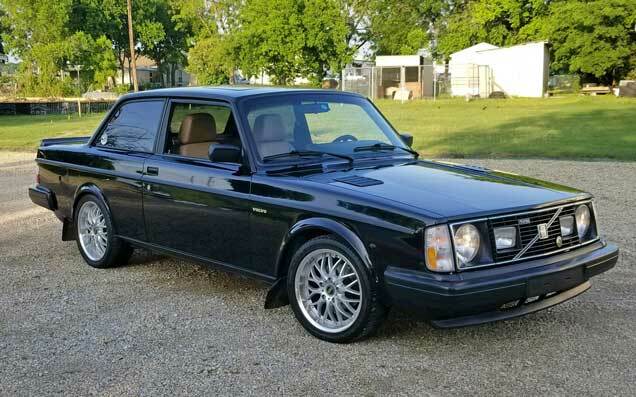 I'd rather be gentle with her and drive it to work a couple days a week not having to worry about it occupying my garage when I need to tinker with one of the 850s. Here lets help this thread......definitely putting down 350-375hp! The 240 mm Saab 9000 Aero Spec clutch...had a very normal pedal stiffness. IMO not worth beefing up the pedal box for this pp...but stronger won’t hurt anything. Last edited by oldschoolvolvo; 12-20-2018 at 04:52 PM..
Fair enough, that's why mine is remaining stock-ish. I really don't (can't) afford a T5 trans swap right now..so I have to be nice to the m47. I agree. If your clutch is stiff enough to stretch or potentially break clutch cables, then I would think about reinforcing it. I just had to fix my sisters 240 pedal box. It had split all the way through around the hole for the clutch MC. Her car engine/clutch wise is just as it left teh factory. The cause I would say was one of teh securing bolts was loose causing the cage to flex. That doesnt' surprise me that the later pedal box is thinner metal. When I had to redo the seats on an 89 sedan I used to have. That sheet metal insdie the seat felt thinner and flimsy compared to the seats I had from just a few years earlier turbo model 240 series.